We also visited Boston, Massachusetts after our short trip to Ontario, Canada March of this year. Our point of entry back to the US is through JFK and after changing planes, we arrived in Logan International Airport. 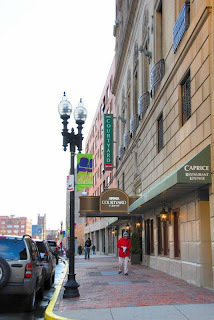 We stayed in Courtyard Boston Downtown/Tremont, located in the heart of Boston. The place is near Chinatown, a lot of theaters and some key attractions. It is also very accessible to other places via Boylston subway train station of Massachusetts Bay Transportation Authority. We had a nice room for we were upgraded to a 1 bedroom, 2-room suite. The hotel is a restored building built in 1925 that's why it has the majestic and old-look feel even at its lobby. There are lots of old buildings and structures in the city. Even as we just go out of our hotel and walk around the area, there are a lots of places that obviously built in the past but still looks gorgeous and stunning. We went to the nearby Chinatown and had lunch at the Gourmet Dumpling House. After lunch, we tried to explore around by walking. We also passed by a lot of theaters that are being restored, including Paramount Theater and Boston Opera House. Nearby shops, there was a small "attraction" that made us stop for a while and watch. We also passed by the Old South Meeting House, famous for holding the Boston Tea Party in 1773. On the way back to the hotel, we passed by an old cemetery and we had no idea what is in it but we still went inside to explore. After researching in the internet, it came to our knowledge that it is the Granary Burrying Ground, an old cemetery in the heart of Boston where key personalities in the history of US are resting in peace. We had no idea whom they were at first (to be honest) because we are not literate in terms of US history back then. Walking back, we also passed by the Massachusetts State House where a protest was currently on-going. Across the state house is the Boston Common, the oldest city park in the US. We didn't do much for the rest of the day and we just had a rest in our lovely room. We only went out for a take-out dinner in KnowFat!. The next day, we went out early in the morning to go to the Museum of Fine Arts, one of the largest museum of arts in the US. They have a vast collection and a significant number of them are from popular artists. I'll be posting more about them later. We also went to the Museum of Science. I'll write more about this in another post. We also went to the New England Aquarium, a modern aquatic display featuring a collection of species. Going back to our hotel, we decided to just walk so we can see other sights along the way. We passed by the Old State House. For our dinner, we went out to hunt for the famous oyster house. We also passed by other landmarks including Faneuil Hall, otherwise known as Quincy Market. We had our dinner in Ye Olde Union Oyster House, a historical bar opened in 1826 and is considered the oldest restaurant in the US. We had a scrumptuous dinner of lobster and oysters and it was really an experience I won't forget. The next day, we went to the John F. Kennedy Presidential Library & Museum. My mom is a fan so we made sure that we drop by here. We also went to Harvard University campus, specifically in the Harvard Museum of Natural History and Peabody Museum of Archaeology and Ethnology. Last attraction that we visited was the Prudential Skywalk in Prudential Center.